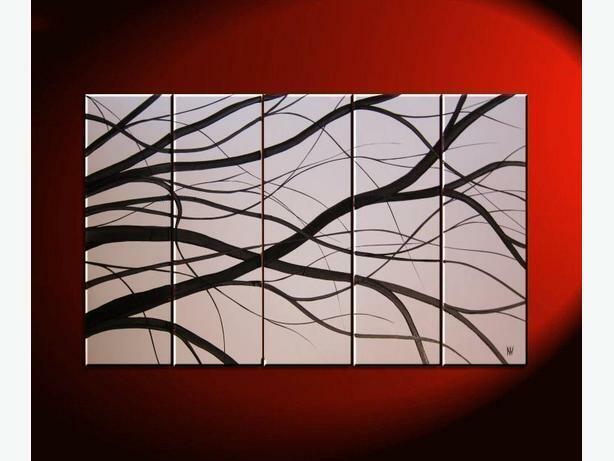 40" by 24" over five stretched canvases (with 1" spaces that comes to 44" wide). This painting's colors are white and black, and there is palette knife texture to the painting that adds interest and dimension. The sides are painted black, no frame is required for a beautiful contemporary look. The painting is varnished creating a museum quality soft gloss look and comes ready to hang. It is signed and numbered in the back. ?? Become a fan on Facebook :) <A HREF="http://www.facebook.com/pages/Nathalie-Van-Fine-Art/238121235097" TARGET=_blank>http://www.facebook.com/pages/Nat...</A> ? ?